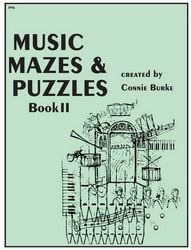 Grades 3–6 • Connie Burke follows the success of "Music Mazes & Puzzles" with Book II, which is still the perfect solution for your sub tub, homeschooling, or general entertainment needs. The word searches and crossword puzzles are quiet activities that will keep your students busy while reinforcing musical concepts. Answers are included in the back of the book.